When I saw this picture, I could feel how much love and complicity there are between them. Here are 15 quotes from the mouth of George himself that prove that Amal is the best thing to ever happen to him. On how long it took him to realize that Amal was something special: “I think about three days in, you could tell. I mean, I knew when I met her that she was so extraordinary and special. And then I wondered if I’d ever get a chance to date her,” he told Access Hollywood. On Good Morning America, Clooney was all domestically blissed out, talking about his matrimonial heaven: “Everything’s different now. Actually, it is. I was going to make a joke but it is actually.” He went on to say the two are restoring a home together in England and jet-setting. When Clooney accepted the Cecil B. DeMille Award at the 2015 Golden Globes, he was so in love during his speech and shouted out to the great woman behind the great man. “Amal, whatever alchemy it is that brought us together, I couldn’t be more proud to be your husband,” he said. In a radio interview with BBC’s Jenni Murray last week, he responded to the question of having children with a simple, “I don’t know,” but had plenty to say about his “very strong” wife, whom he said he’s “very proud to be married” to. I agree with your comment Nati, They are very… my good the must! 💏💏💏. I love these two together. You can see how happy they are- they glow! So glad they found one another. Their worlds are so different, they might not have. You are a hopeless romantic Nati! You have placed them on a pedestal. I hope they never let you down! i don’t think they care. the majority have moved on, and if asked, they would gush about their significant others the same way George does about Amal if not more. good for all of them! I would love to hear Amal’s side as well. Did she like him right away? Was she hesitant because of his reputation? How did she feel going out with him the first time, then when she got home??? Reading this compilation of remarks from George just shows how much he truly loves Amal. I do believe she is the love of his life. I think she has changed his life forever. Thanks nati. Very sweet post. I love her style and his affection …this has to be a photoshopped photo how could she realistically have that bone thin an arm, that photoshopped to change the way she looks, it’s not flattering to her ….George should change his shirts occasionally and mix it up …sometimes he could advertise the plight of elephants or rhinos or whatever other causes he has …a lot of other celebs should take advantage of the paparazzi and wear or carry signs …to get the good words out ……about issues …. That’s unfair – I have VERY thin arms and very bony wrists and hands (I put on weight around my tummy). My mum was the same. Some of us are just like that, not hugely attractive but hey. Amal is obviously like that too. My arms are very thin too. My arms are too. I think she has beautiful, elegant arms. There are similar photos all over the net with George looking in love with all his previous girlfriends too. This is nothing new. Sorry, but with Amal the story is different and this picture is gorgeous. No it’s not Nati. You just believe it is because that’s what you want to see. His ‘look of love’ is sadly not unique to Amal. There are photos everywhere of him fawning over his previous ladies. Some of those photos look pretty convincingly like he is ‘in love’! She could’ve done so much better than George. 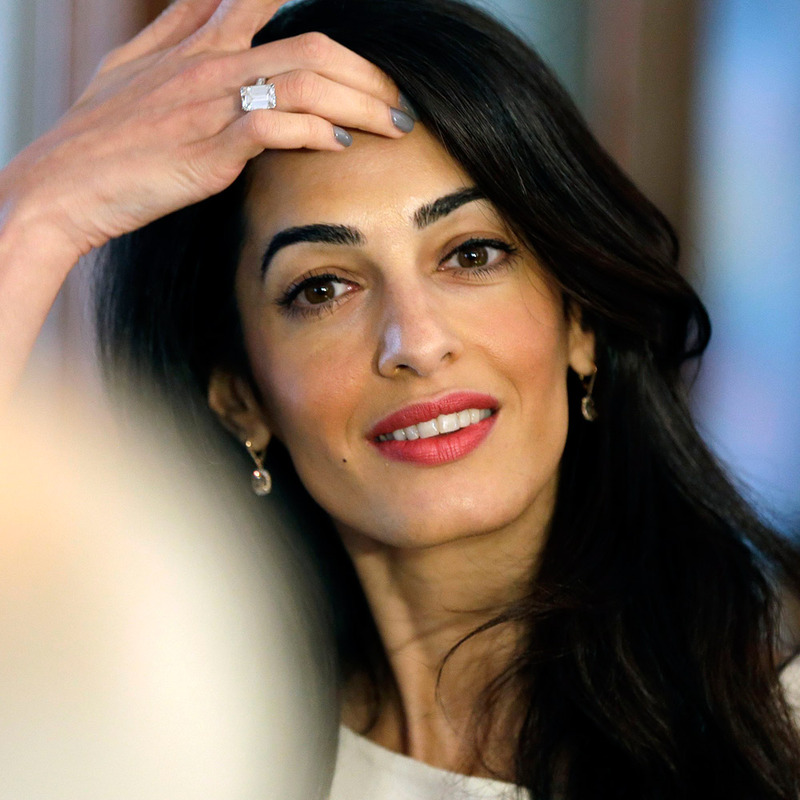 Amal sadly married a very used product. I think that we have two different Anna on this blog. For you, it will be your last comment in this style. If you don’t like her, if you don’t believe in their love story, don’t visit this blog. Why should it be different? I mean George is over 50 now, would it not be normal that he has loved his previous girlfriends a lot too? Amal is not the first women in his life. It would be sad if he had to wait 50 years to meet a woman with whome he falled truly in love. I am not saying that he does not love her. But if this is really a deep love (and different from all the previous ones) we will know maybe in 5 or 10 years. Now their relationsship is still fresh and exiting. A lot of things are new for Amal, it is still not boring to be on his side. And for him too. 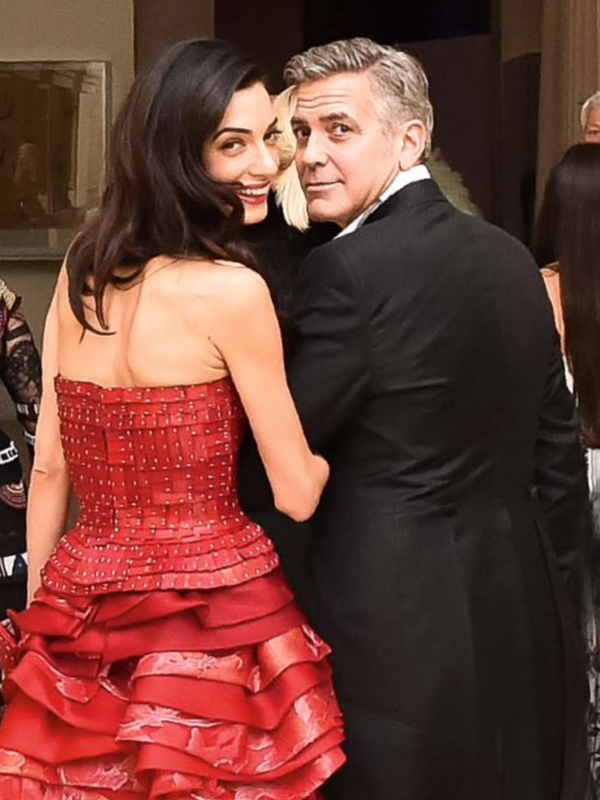 George’s feelings for Amal are true love and it is why she is “the One”. it is an unique feeling.